Quick one page blogs on fast and easy tips and techniques that can be implemented quickly and affordably. Clicking on any of the articles below will enlarge them. In this graphic here I demonstrate how powerful controlling what's going on just out of shot actually is. In these four setups nothing changes with the lighting whatsoever, every shot is lit by the same single beauty dish but you can see how much the subject changes from shot to shot. Thankfully, this is not always a bad thing. Sure light bouncing light around in a room with a red wall is a nightmare, but adding white sheets either side of our subject can create an incredibly beautifying light and we are still only using that one light. Conversely we could add some black sheets either side and we can create some very flattering and thinning shadows to our subject. All of which happens just out of frame. Lighting NEVER exists in a vacuum, it always interacts with our environment for better or for worse. As a result we need to pay just as much attention to our shots surroundings as we do our actual image. Without looking, would you be able to describe the lighting characteristics of a small white umbrella compared to a white beauty dish? This might sound ridiculous, but it's by having this knowledge that we can begin to build our own looks with light. There's nothing wrong with copying someone else's lighting whilst you learn, but at some point you'll want to branch out and start crafting your own looks. Once you have enough experience, you'll be able to make informed choices on how to light something over the somewhat frustrating trial and error process you may currently have. Will this umbrella cast shadows on the background behind the subject? Will the falloff of light from this ring-flash keep my background dark? Will this silver modifier give me a stronger colour saturation here or should I use a white modifier for this pastel gel? Imagine a chef preparing a complicated meal. They're not following a recipe, they are following their instinct and experience of what will work in a variety of situations. Lighting is the same, you need to know not what something does, but how it will react to the situation in front of you. Take a look at these shots and pay close attention to the shadows. Look at how dark they are, how they transition from light to dark, how harsh their edges are and so on. Now do the same with the highlights. Sometimes there wont even be any highlights, why is that and how can I control it? I've put together a few big articles recently so I thought it was about time we had a couple of quick-tips too. This week I take a closer look at the first part of the top ten things I NEVER leave home without when shooting. Some of these you may already have stashed in the bottom of your bag but others may have only make it there after its too late. The spare sync-cable is a classic example of something that has saved my shoot on more than one occasion so make sure it's in your bag now. Here's the first five life-savers but what are some of the items your camera kit never leaves home without? Okay so here's the second set of 5 things your camera bag needs. Last week I mentioned 5 items that included gear like a spare sync cable, and wouldn't you know it I NEEDED that sync cable the very next day on a shoot. These items, (although delivered in an internet friendly and consumable way), I promise you this isn't a gimmick. I keep these in my bag because they're aren't there because they 'might' come in handy one day, I guarantee they'll come in handy one day. In this second set of 5, I think the biggest game changer could be the utility gels like diffusion gels and neural density gels. It's this item that will actually visually improve a shot, not simply provide a quality of life improvement. The neutral density gels can be a perfect way of reducing strobe power to achieve very wide apertures like f1.8 and this can really open up alternative creative possibilities. I rarely talk about them, but it's these utility gels that I use more than any other. In the past I've expressed that people use complimentary colours in their work when they're working with colour in their imagery. At this stage it's pretty hard to argue with that advice as complimentary colours are the most popular form of colour theory used but why are complimentary colours so visually strong to us? What is it about these colours that resonate with us visually and why? I appreciate that this slightly deeper dive into colour theory isn't for everybody but I do think that for those who really want to develop their own style and 'visual palette' it's really useful to understand not only what colours look good but why they look good. In this image here (that I urge you to save somewhere sensible), I explain that all complimentary colours are simply made up of the three primary colours. The primaries are red, yellow and blue and you should notice that every complimentary colour set has one primary colour within it. What you may not notice however is that the other colour to that complimentary pair is in fact a combination of the two remaining primaries. For example blue and orange are complimentary colours. Blue is a primary colour and the other two primary colours are yellow and red. The additive colour wheel is used to determine how transmissive displays mix colour. A transmissive device is a TV, smartphone, laptop etc. These items use Red, Green & Blue as their core primary colours compared to our regular colour wheel (subtractive colour wheel) that uses Red, Yellow & Blue. This series of diagrams shows you how the two colour wheels mix their primary colours compared to one another. Why do we need to know about this colour wheel, after all we dont use a TV to take our pictures? No we don't use transmissive devices to take photos but we do use coloured light to capture every single frame we shoot. By understanding how completely different these colour wheels are we can craft better images as we begin to understand just how differently coloured light mixes compared to coloured paint. I know this side of colour theory is getting a little trickier to grasp now but next week I aim to release a comprehensive article that looks at both of these colour wheels in a lot more detail and I will provide a complete look at certain coloured light combinations to avoid and why. I find it odd that there isn't as much info on this for photographers as you might expect. Sure there are a ton of physics posts out there on the vibrations of certain lightwaves but nothing really targeting what we need as photographers using light. One reason for this might be that as photographers we operate in a paradox of colour theory. I joked last week that light striking our model is bound by the laws of the additive colour wheel but conversely, as that light is then reflected back at us into our cameras, the rules of colour theory shift so that the subtractive colour wheel takes president. Like I said, this is a very niche problem that us as artist who use light as our primary tool face so if you're finding it hard to grasp, I assure you that you're not alone. In next weeks article I aim to demystify some of the issues we face with this or at the very least, I hope to point out some odd results of mixing certain colour combinations that will certainly be of interest to anybody who uses coloured gels. In this tip I thought I'd share something that I've been using for a while now that seems to have helped me nail focus far more consistently in certain situations. In a lot of my shots and setups its either dark or dimply lit either due to location or circumstances like ND filters on the lens and so on. Neutral Density filters are great for shooting with strobes when you want to shoot wide-open but it does make the view through the lens very dark indeed. This can lead to auto-focus nightmares like 'searching' and ultimately failing to find focus. The quick solution in the past has been getting somebody to hold a mobile phone torch and shine it onto the model (don't lie, I know we've all done this). This is hardly ideal, especially if you're on your own, so this mini lightweight LED hot-shoe panel is perfect for lighting up your shot without affecting the overall exposure. Congratulations, you now have a Transformer for a camera! This evenings post is the result of me hearing more than one fairly well known photographic educator perhaps 'confusing' their audiences with some more lighting myths. The myth being that grid attachments somehow affect the quality of light that leaves the modifier. What I mean by 'quality of light' is that there seems to be a misconception that grids increase shadow density and shadow drop-off somehow and unfortunately this simply isn't true. 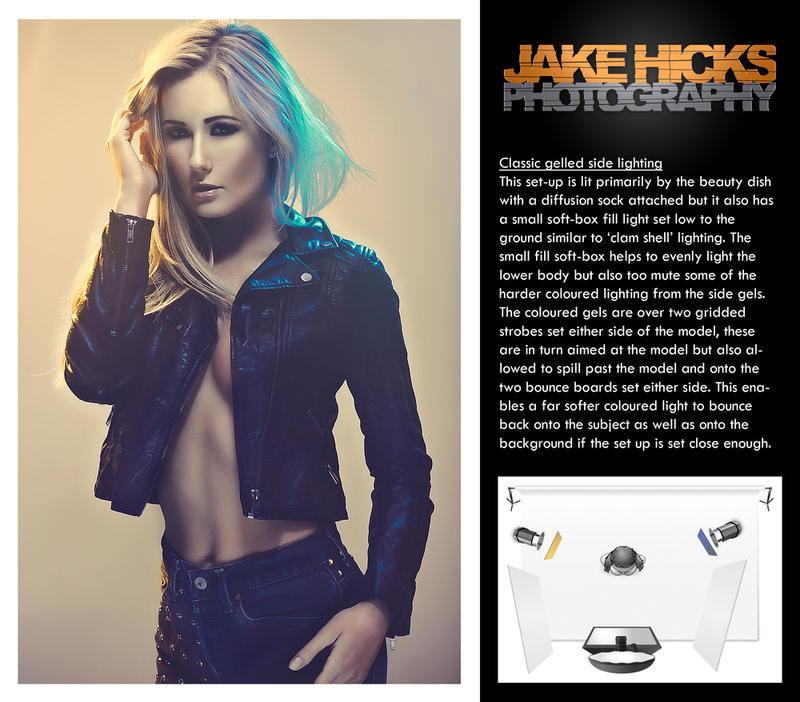 Ive provided an info-graphic-thing here with two images; one taken with a beauty dish grid attached and one without. I think the results speak for themselves and clearly show no difference in shadow density and drop-off one image to another. So where has this myth come from? Well like I explain in the diagram, grids channel the light and nothing more so without a grid attached in a white studio, light is left to bounce around which can in turn lead to the filling in and softening of shadows. With the grid attached, the light doesn't bounce around the white room and the shadows remain untouched by unwanted light. This is where I personally believe the myth has come from that attaching a grid increases shadow contrast. So why even bother using a grid then if doesn't do anything? I actually use grids all the time in my setups as I am very careful to not allow lights to affect one another in a setup. Its very easy to wash out the power of a gel with another light so using grids on my lights ensures that every single light goes exactly where I want it and nowhere else. This one is on the importance of Polyboards and DIY versions of them if you're on the go or on location. Truth be told, I think I actually use my DIY versions more than actual Polyboards so I definitely recommend you either get some or make them part of your photographic kit as soon as possible. Have you ever wondered what the effects of some art lenses look like compared to your standard lenses? If you owns Lensbaby lens or you're thinking of getting one then I recommend you check this out to see how their individual signature looks compare. There are simply just going to be times when a five minute retouch is all that's needed on a shot. Sometimes you want to prep a whole bunch of images for client review but don't want to fire them off completely raw looking so a few simple steps to spruce them up can have a big impact. Step One - The Clean Up - Removing visually distracting items in an image can be a simple way to clean up the visual impact of the shot. Removing spots and straps can also be done really quickly with practice. Step Two - Poor Mans Dodge and Burn - Dodging and burning a shot can have a major impact but it takes time to do well. This little visual trick will had depth buy adding contrast to shadow and highlight transitions. Step Three - Stay Sharp - Sharpening your image is often overlooked now that we don't print anything anymore. If you're not printing a shot then don't be afraid to push it a little more than you might normally, this can be especially true if the shots are just proofs and will only be viewed on small screens. Step Four - The Colour Tone - This is always done right at the end and can really help to tie a whole image together, even if you don't add much this will help to give your shot a more uniform colour palette. 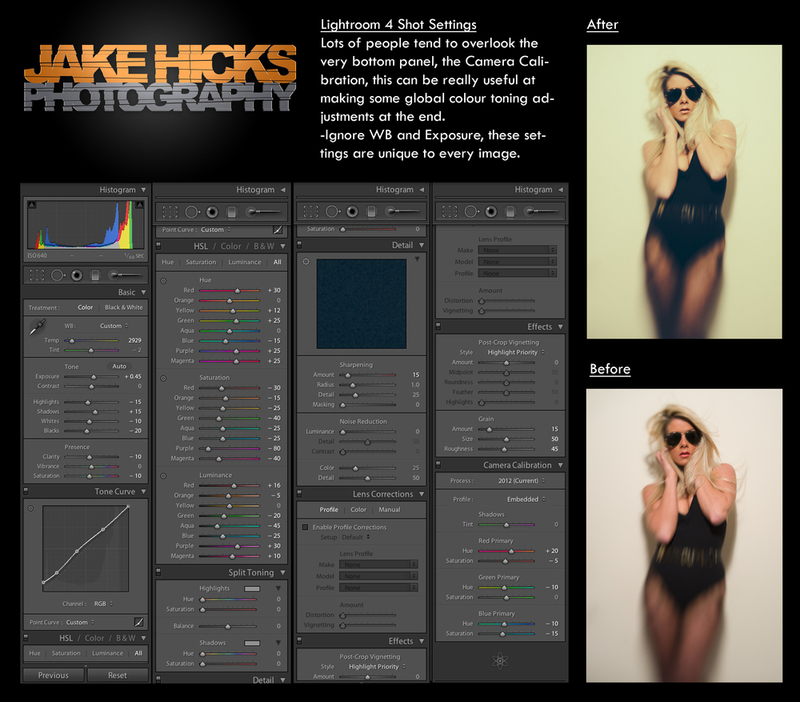 Like I said these tips are great for quick and simple edits, and whether you're getting a bunch of shots ready for a client to proof or a model to choose from, these simple steps can transform an image in no time. In this weeks instalment I share a method I use to keep my beauty and portrait shots looking as clean and as symmetrical as possible. 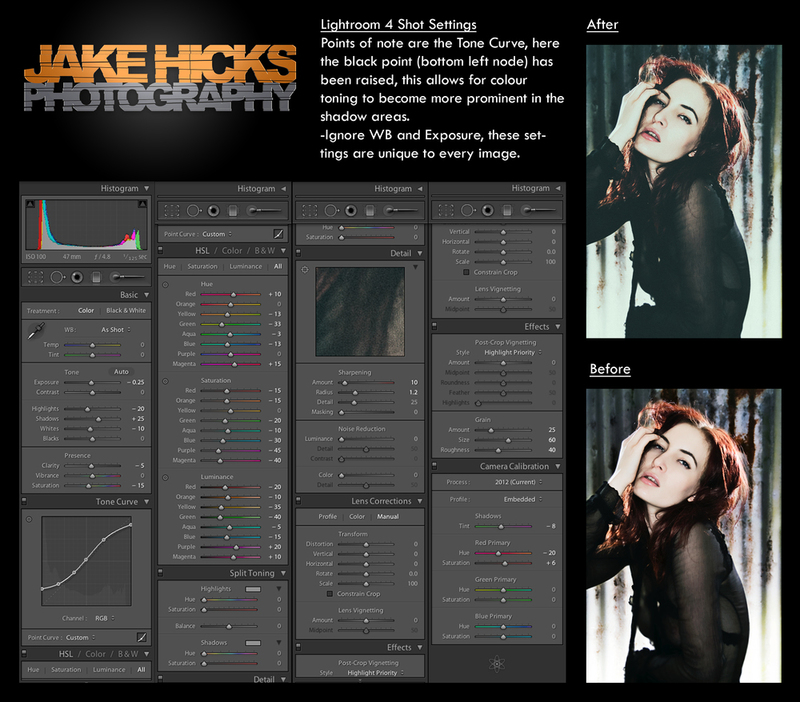 Check it out and give it a go to see how it tightens up your portrait lighting dramatically. 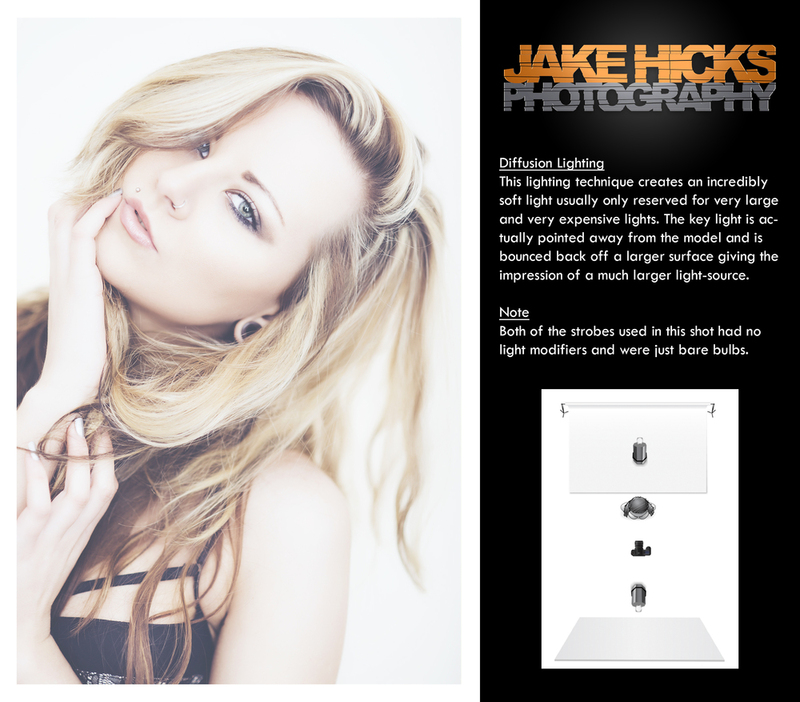 We've spoken before about hard and soft lighting and what modifiers create certain looks. There is a third type of lighting though and this is the one that is most overlooked in my opinion, the diffused light. Diffused lighting is the one that has no noticeable directionality, it seems to be coming from everywhere. In the natural light world this is the incredibly overcast (often British) days that even at midday creates no visible shadows on the ground. It's this type of light that often simply gets labeled as 'shadow area'. Think about a large area of shadow, imagine yourself standing in that large shadow area and look at the ground, are you casting a shadow on the ground? Probably not, because you're already in shadow and thus essentially being lit by that shadow and because that shadow is so diffused there is no possibility of casting more shadows within it. :O Now before you wander off and start watching another cat video instead of listening to Jake talk about the 'Shadow-Inception', apply that same diffusion principle to light. Diffused lighting can be an incredibly powerful tool in lighting and one that I apply a lot when I'm working with gels because as those that have been on my workshops will know, you can only gel a shadow area, not lit area. Mastering these three types of light is key to stronger, cleaner, richer looking imagery, and the sooner you realise that not all shadows are created equal the sooner you'll better understand lighting and how to interpret it. This is a handy little flash card for the three types of light but I aim to do a more comprehensive piece on this and show more examples of these three lighting styles working together. The biggest stumbling point people have is that they assume coloured light mixes in the same way as physical colours like paint. It's a reasonable assumption so don't feel too bad but it's a major factor in why some of your gelled lighting shots maybe looking washed out and insipid. Remember the more coloured paints you mix, the darker the resulting colour. Conversely though and most importantly, the more coloured lights you mix, the lighter the colour! A look at one of the lighting techniques from one of my setups on my Colour Gel Portraits tutorial video. In this setup you'll see that it only requires two lights, one of which is gelled and some clever bounce board placement to control the light. This setup looks easy but it might take a few shots to get everything at the right distances to achieve the look you're after. This particular topic is going to be a little more subjective but it's my opinion that you should be more careful when using a softbox than you originally thought. What I'm saying here is that every modifier has their stronger positions or 'ideal' distances to a subject. A large softbox up close to a model will provide soft light but a large softbox situated 100metres away from a subject will also produce hard light. I'm not saying this knowledge can't be used to produce great photos but I certainly think it's worth being aware of it. I've seen many photographers using a softbox with the intention of achieving soft light but placing it a long way from the subject and definitely not achieving that desired soft light. Just because you're using a softbox it doesn't automatically guarantee you soft light. To further compound the confusion of this, the theory is that that a light further away from the subject gets smaller and thus produces harder light. This is correct but in reality this never happens in a vacuum, it tends to happen in a room or studio that is surrounded by white walls. As a result of you moving the light further away from your subject you in turn raise the power of the light to compensate. Now when you take a shot that powerful light is bouncing its rays around in that big white room resulting in a flatter looking light when it reaches model. We refer to this as 'flat' looking light because the quality of light has lost some of its directionality. Again I will reiterate that I'm not saying this can't produce a nice shot but it's important to be aware of it so you can control it accordingly or move that softbox closer to avoid it. Definitely worth giving it some thought next time you're in a big white studio with softboxes. But with all that being said let's take a little look back at the last 12 months and see what you-lot thought was the bestest visual candy! This technique requires you to feather the light past your model and to feather the light you simply angle your light past your model rather than directly at them. Recently I've received lots of messages from people who've purchased my gels but wanted some advice on the best methods for attaching their new toys to their lighting modifiers. 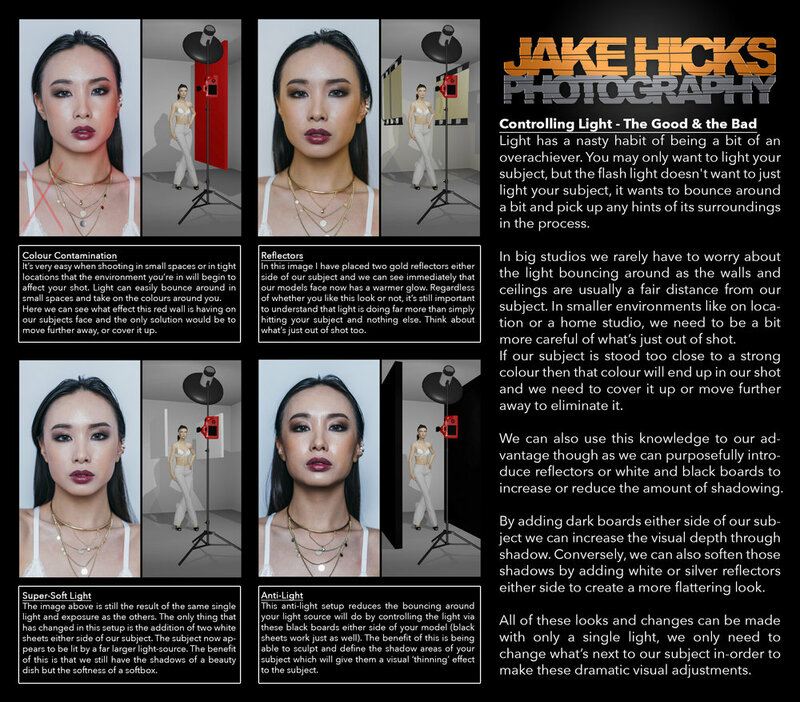 If you haven't given all of these a try with all of your modifiers I strongly recommend you do so, especially the bare-bulb one as that can give you a gorgeous look when bounced around in a white room :) …just remember to leave the modelling light OFF! This is a really cool lighting set-up and I love the results its gives. Don't be fooled though, this is still a tricky one to achieve but that's always the case when working with soft-lit gels, they are extremely vulnerable to being washed out by white light like your key light and fill light. The trick to this is meticulous light management so start off by setting up your gelled side lights first. Make sure you're happy with the colours they're producing before you setup your key and fill light. Something simple but you only have to get your bag checked once like a criminal as you leave a studio to realise how important it is to personalise your kit. I tag all my lighting equipment with red electrical tape so it's simple and easy to spot what's mine when it's packing up time. Controversial as it may be, there are things that you can realistically except from a model on a shoot. The more experienced and seasoned models will rarely make these mistakes but still accidents happen and things get overlooked, make sure you're aware of them before you create yet another post-pro nightmare for yourself. The look and feel of a colour in gelled photography is heavily influenced by its modifier but how do they react when both hard and soft gels are in the same shot. Using a colour wheel on set can certainly help to determine what colours to use when matching styling as well as environments and backgrounds. I take a look at the three most commonly used sets of colours; complimentary, triadic and analogous colours. Sometimes you don't always have the time or space to setup a floor stand (or don't even have one) so a Super Clamp can really help you out in a pinch. Perfect for those clam-shell beauty setups. Sometimes you'll see a shot that you love and you'd really like to know what they used to create it. Did they use the latest Nikon or are they using a 2K lens to get the look. Grab the image url and fire it at this free online service that checks the meta data of each to find out more. Carrying around certain modifiers from set to set can be a pain and if you've got the spare money hanging about you can certainly invest in a nice carry bag for them. For the rest of though, we'd like to save our money for camera equipment not camera equipment bags.Bring on the Crimbo wreathes. There are no rules in photography ……..apart from these ones! There may not be any strict do's and don'ts in studio lighting but these are certainly some very good ideas that you're better off abiding by to get the best shots. This must be the most under-utilised filter in Lightroom. The search option has been staring you in the face for years and although may not think you'll ever need it when you do it will save you hours and hours of time searching as it filters down thorough thousands of your photographs in seconds. We've often seen those funny sheets of tracing paper in our gel packs and wondered what they do, well they're diffusion gels and they're a great way to slightly soften the harness of certain light from lighting modifiers. I always find it interesting to see what other photographers have in their camera bag so I thought I would return the favour and share what's in mine. I'm certainly not somebody who needs all the latest and greatest gear but what I do have has certainly served me well for many years. Today I wanted to show you some of the extra items of gear that I always carry in my kit bag; a diffusion filter and my Lensbaby Composer Pro 50mm. These two little items can open up a world of creativity and although the lighting has not changed at all in these three images shown here I was able to achieve some very different and interesting results. The key take-away for this weeks post is that although some of these 'technical' looking set-ups can at first appear overly complicated they are actually just a combination of several far simpler lighting techniques. Should I use Lens Filter? Today I take a quick look at the cheap lens filters we often subject are expensive lenses too. Unless that filter is changing your image for the better, do your photographs a favour and remove that so called 'lens protector'. Here is a step by step shot build of the 'Hard and Soft' lighting combined. Each stage creates a very useable shot but by combining up to four lights like this you can create a very flattering lighting set up that takes all the benefits of both hard lighting and of soft lighting. I quickly did a test for you guys on the shoot yesterday with a few variations of beauty dishes. I used the Bowens 21" silver and the Bowens 21" white dishes with the diffusion socks on and off for both. The results can be seen here and although at first glance they appear subtle, closer inspections of shadows and highlights will reveal differences that may influence your decision on which one you use. Here I take a little look at how I keep track of what works and what doesn't with my gels and so I record the combos using the LEE Swatch app. Although I'm a firm believer in tried and tested colour theory the same rules don't seem to apply when using gels on skin. Colour combos that should work, don't seem to work so well when mixed with skin tones. I certainly hope you get chance to play with this simple but effective technique which literally just involves hanging scrunched up tinfoil behind the subject. If you're wondering how the foreground bokeh is also achieved then you can find out those tips on here too. Tonight I thought I'd share a little review on a very inexpensive piece of kit that I always have with me on shoots, the 'Crab Clamp'. Today I wanted to share a little tip on how to shoot right under your key light for great symmetrical beauty lighting without the need for the space hungry and costly boom arm. This is a great quick and easy way to shoot with a soft colour tone to your studio images. By placing a silver reflector on the floor and bouncing a coloured gel back up onto the model you create a great soft coloured fill light. Which colour-space is right for me? Nearly all DSLR cameras are shipped with the comparatively small sRGB colour-space applied. In this mini article I discuss why it may be beneficial for you to change it the much larger Adobe 98 colour-space. The regular old triangular prism you used to have in science class can not only be used to create some pretty cool light play in your images but you can also pick one up for less than the price of a cup of coffee. Definitely worth having one in your bag for those times when you'd like to experiment. Diffusion filters are screw on filters that attach to the front of your lens. They help create a hazy, dreamy effect to your image by reducing overall contrast. These are never going to substitute the power of desktop applications but for those times when you'd like to try something creative on the go, some of these will surely fit the bill. A great way of achieving creamy highlights and reduced blacks in a contrasty image. Remember seeing those lovely fresh fruit and veg shots where all the little beads of water are glistening in the light, this is how those shots are created. Glycerin is easily obtained, and mixed with a little water and sprayed onto objects creates a fantastic sheen and glistening effect, here's the recipe. This is a simple and effective way to create diffusion lighting on the face, a very flattering lighting, and a hair light, all with a single light source. These are usually circular filters that screw directly to the front of your lens. These filters reduce the amount of light entering the lens ad are used to create long exposure shots of waves and waterfalls etc. They can also be incredibly useful for achieving some the wider apertures with your faster lens when using studio strobes. Feathered lighting is most commonly used as a key light to flatter the subject but here Im using it to evenly distribute the light across the background, great for seamless/colorama's and even reducing hot-spots on chroma key backgrounds. Another shoot through technique, this time involving crystals. As we know crystals are multi faceted so can create some fantastic light play in your lens just by holding them up and shooting through them. There are times when the same old standard and stark ring-flash shots will need something a little different. Here you can quickly and simply apply colour to your backgrounds and give them a completely different look and feel. The Histogram never lies………or does it? The main white RGB histogram we look at on the back of the camera is actually an average of the separate R, G and B channels. Sometimes if separate channels are actually polarised enough they will skew the average combination enough so that they give a false impression of no clipping even though there might actually be. Create interest and hold the viewers attention by creating depth. One simple way to achieve this is to place objects in the foreground. Here I use Clingfilm to catch the light and create atmosphere. There are times when you want something a little different to the standard white wall background. Lino can be a cheap and effective alternative if space and budget doesn't allow for something more glamourous. A simple way to create coloured gelled side lighting. The thing to watch here is the balance of light from your beauty dish key-light. Its very easy to overpower it and loose the colour detail. Here I share the lighting setup for a simple strip box portrait. Shooting between the strip boxes like this not only creates an interesting catchlight in the eyes but provides a very even lighting. Counter that a little buy bringing back some shape to the sides by introducing black boards on ether side. This little secret weapon should always be in your bag. There are going to be those times when you want to blow out the highlights to create a dramatic effect, this can easily be achieved by adding shine to your subject and baby oil is perfect for this. A recipe on how to add greens to your shadows and mid tones by reducing overall contrast. 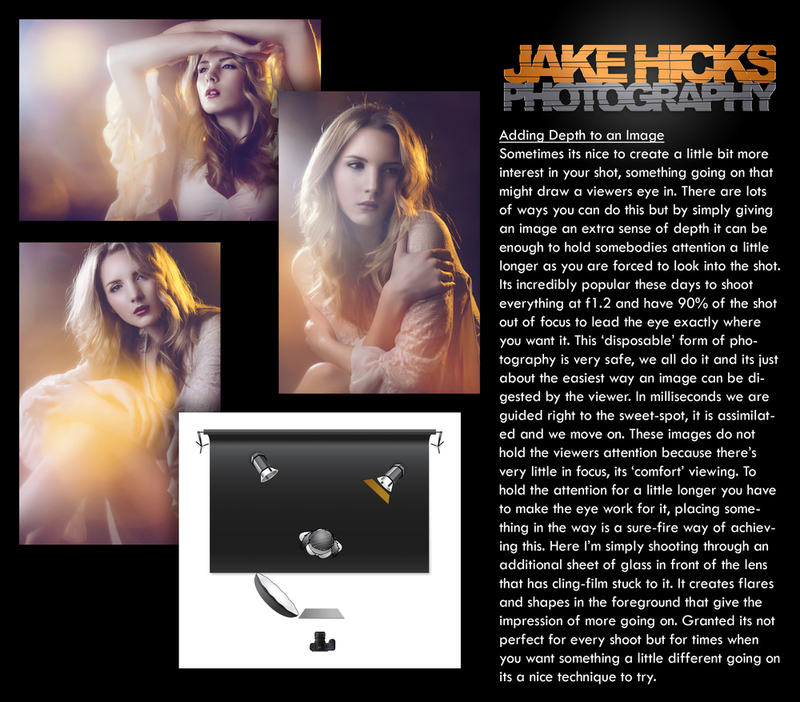 The hard and soft key light technique may actually be used more often than you think and this interesting technique can certainly produce some interesting results, especially if the styling and hair would benefit from some crisper highlights and shadows. Being able to fully control your light including the spill of light in a smaller studio with lots of reflective surfaces like whit walls is crucial. Here I discuss how simple black velvet sheets can be a far more convenient, cheap and practical alternative to large studio poly-boards. Cinefoil is an aluminium foil coated on both sides with matte black heat resistant paint, ideal for flagging and gobos. Here's a very cost effective way of building up a library of backdrops. Using window blinds is very inexpensive and transportable but they also come in hundreds of different styles to suit any shot. 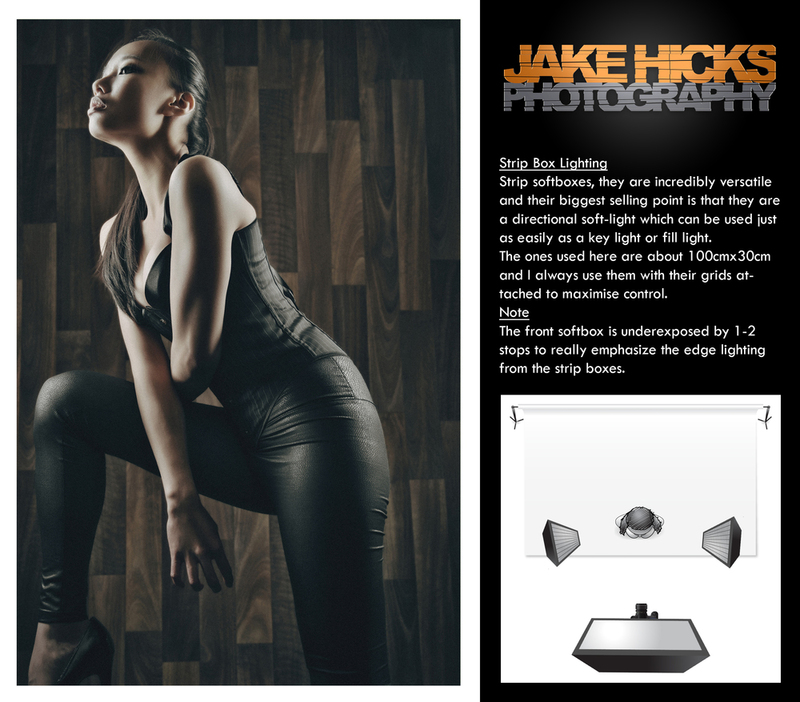 Here's a quick lighting setup for emulating a window light portrait. The key is the diffusion of light as well as the overall size of the light source. This is probably the most used lighting setup for portraits and beauty shots. Whats important to note though is that its harder than to looks to set correctly. This technique requires you to 'read the light' not just set up the light, getting it wrong will make for a very unflattering portrait. Classic edge lighting like this appears simple to setup but can be a little tricker to balance the lighting ratio than first assumed. Here you want to actually underexpose your key light to get the desired effect. The simplest way to get started using your strip boxes is to place them evenly to the sides of your subject and then decide on much shine you would like at the edges. Underexposing your key light will certainly emphasise that. Diffusion lighting is one of the most flattering forms of lighting and is incredibly easy to setup and achieve as it can be done with just one light. Long exposure shots usually have the tell-tale orange smudging from the mixing of lighting temperatures of flash and ambient but if you don't want that look you can easily eliminate it with coloured gels and an additional light. There are times when you want to break the rules for creative reasons and adding lens flare to an image is a great way of adding interest atmosphere to a shot.